Rome (VNA) – The Italian Senate supports the early ratification of the free trade agreement (FTA) between Italy and Vietnam, Senate President Pietro Grasso told Vice Chairwoman of the Vietnamese National Assembly Tong Thi Phong on May 25. During his meeting with the Vietnamese legislative leader in Rome, Grasso said Vietnam serves as a gateway between Italy and the ASEAN, adding that the Senate will help boost ties with Vietnam in trade, investment, culture, training, and peace keeping. He cited the Italian Faculty at Hanoi University as a model for promoting mutual understanding between the two nations. The Italian Senate President accepted an invitation to visit Vietnam from his guest. 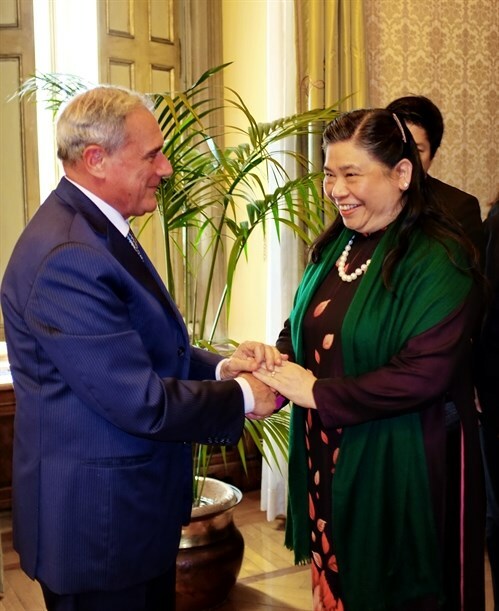 The Vietnamese NA Vice Chairwoman, who is on a working visit to Italy from May 25-29, affirmed that Vietnam attaches great significance to the strategic partnership with Italy, which is the foundation for the two countries to enhance their friendship and multilateral cooperation. The legislator expressed thanks to the Italian Government and people for the support they have provided Vietnam, particularly in international integration, highlighting the ratification of the Partnership and Cooperation Agreement (PCA) between Vietnam and the European Union and the EU – Vietnam Free Trade Agreement (FTA).